Try prototype of a 3d version! 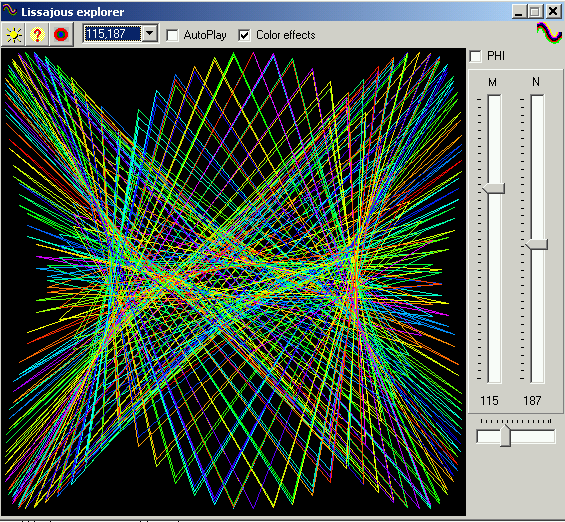 Lissajous explorer. Enables visualization and interaction with Lissajous figures, a scattered composition of two waves, they represent a link between vibration and matter as composed grids are those found in crystalline substances. Includes preset values and a random generator, try the 115,187 preset pair an oscillating pattern of a butterfly wing. Hear the figure with the auto play feature, plays 3 octave midi chord with the selected M, N values in octave 0 scale. Jules Antoine Lissajous (1822-1880) was a French physicist who was interested in waves, and around 1855 developed a method for displaying them optically by reflecting a light beam from a mirror attached to a vibrating object such as a tuning fork. Lissajous figures are also used in Cymatic research.